This Mexican Street Corn Salad is out of this world good. It is so easy to make and full of flavor. It only takes a few minutes to throw together and will blow your mind. And it's way better than eating it off the cob. My husband and I recently found a little local restaurant that serves amazing Mexican food. They also had an all-you-can-eat salsa bar, which is pretty much heaven to me. I could eat salsa for every meal and never get bored of it. My husband ordered an amazing combination plate that had a little but of everything on it- including a piece of Mexican Street Corn. He took a bite of it and immediately handed it to me so that I could try it too. OH. MY. GOODNESS. Where had this been all my life? It’s was cheesy, creamy, and loaded with flavor. Hands down the best corn on the cob I had ever tasted. I came home and googled it, which then pulled up Mexican Street Corn Salad, brilliant. So much easier than coating each cob of corn individually- you just toss it all together in a big bowl and serve. Perfecto. what could i use in place of the Cojita Cheese? I personally could not find cojita cheese at the store the other day when I was making this recipe, so I replaced it with feta cheese. You could also use a goat cheese if you don’t like cojita or feta. If you don’t like any of those options, you could also used strained cottage cheese, or simply omit the cheese all together. should i serve this warm or cold? I like to serve this warm, but you could also serve it cold. I know my sister likes it cold when she dips her tortilla chips in it, but when I serve it for dinner, I microwave it for a little to get it warm. In many Mexican restaurants, street corn is one of my favorite dishes. Throw all the ingredients together in a bowl for this delicious salad! Heat oil over medium heat. Add frozen corn and let cook until corn starts to char, stirring occasionally (it took about 7-8 minutes before my corn was lightly charred). While the corn is cooking, mix together mayonnaise, cheese, lime juice, cilantro, red onion, garlic, chili powder, and salt and pepper in a large bowl. When corn is done, gently fold it in with other ingredients. I am obsessed with roasted corn and this salad looks so amazing! Thanks for sharing. This sounds really good, but I really dislike mayonnaise. Do you think plain greek yogurt would work for this? Thank you! You could add greek yogurt instead, but the taste would be altered. I can't eat cheese right now. Should I wait to make this or try it without the cheesy creamy goodness? I would wait to make this when you can follow the recipe as written and enjoy all the ingredients. I bet you could substitute Ranch dressing here, and it would compliment the dish just fine. I imagine you could also use Ranch dressing as substitute in this dish. Should compliment the flavors just fine. Could you use canned corn? And how about when you serve it, could it be warm or cold? We are camping this weekend, and I wanted to try this salad. Thanks!! You can use canned corn and it can be served hot or cold!! I needed a change from the same old sides. Made this tonight and it's now my absolute favourite!!!! I had some extra corn on the cob so I looked on Pinterest for a corn salad recipe and came across your recipe. I roasted my corn on my gas grill. I did not have any Mexican cheese or Feta in my frig so I used grated parmesan. I also just eyeballed the ingredients which was easy to do. I will definitely make this salad again. Thank you! THIS. IS. AMAZING! I also substituted Parmesan instead of Cotija. Soooooo YUMMY! Awesome recipe!! I won a contest with it. It's so easy and sooooo good. Have patience pan roasting your corn. Well worth it. I use thawed frozen corn and it was perfect. This is not just a summer dish. Try it with taco seasoning in place of chili powder. YUM!! To find any nutritional information on our recipes, just click on the MAGIC button under the picture, then click on the little NUTRITION bullet on the top left corner. You can find this info on all of our recipes!! The calories will be less if you get more servings than listed on the recipe. Ok - so I see this is an older recipe but I had to comment. I LOVED IT!! I left out the jalapeno and used feta. I ate a few bites warm and a bunch chilled with lunch and now it's in my fridge.... shhhh, can you hear that? It's calling to me. Mmmm! Thanks for the recipe! I made this over the weekend. This has to be absolutely the best thing I ever ate!! I will DEFINITELY be making it again! I added chopped avocado on top -- delicious! Amazing! Just finished making this and I had to stop myself from inhailing it all. I used a mixture of the feta and parm cheese and it was yummy! Easiest and most delicious thing I've made from pinterst in a long time. My family went nuts over this! I am making it tonight for the THIRD time this week!! Thank you! This is an instant family favourite. Full of flavour and delicious. I used feta and it worked a treat! I just took a bite of this hot off the stove, and it was sooo good! And that was without cheese - trying not to have dairy - so I can even imagine how much better it is with cheese! My changes: 2 jalapeno peppers, quarter of a sweet onion, juice from 1 lime, and only 1/4t chipotle chili powder (it's got kick to it). Tried this recipe yesterday and packed it to hubbs for lunch. He loved it and so did I. Absolute keeper. Have shared the recipe on my blog as well and have linked to here and your website. 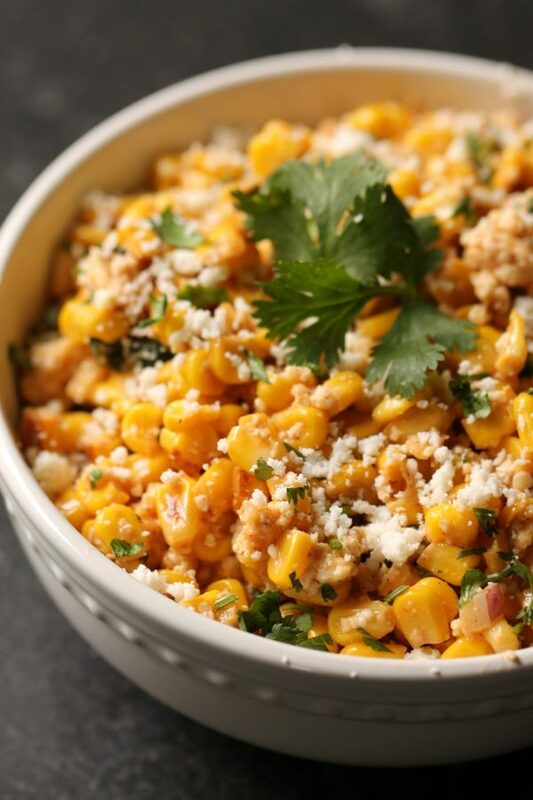 https://lifescribblesovercoffee.wordpress.com/2015/07/07/mexican-street-corn-salad/ Thank you for sharing! I have made this salad but I call mine deluxe as i add one can black beans drained and rinsed, two small zucchini with seeds removed and cut small. Green pepper and used 1/2 again the lime juice and the hot peppers. everything I added was cut to a size close to the corn size but the hot peppers were even smaller, very small. I let it sit overnight and added more sea salt and pepper to taste. I was so amazed how great this went over. The guests used it as a dip and also as a side dish and than went back for the rest. instead of mayo I used a salad dressing. It is a little sharper a flavor. Once corn comes into season, I am going to put a hurting on this recipe! This is SO YUMMY! It was good with the frozen corn, but I bet it will be amazing when fresh corn is in peak season. I made the following substitutions based on the time when I lived in TX, and I had street corn there: Mexican Crema for the mayo (most grocery stores have this in either the cold section of the Mexican aisle, or by the cheese), roasted the jalapeno on my gas stove then put in a container for about 15 minutes to soften - roasting mellows the jalapeno a bit. I like things spicy, so I added the whole jalapeno, but removed the seeds. Keeper definitely....perfect different side dish for our Taco Tuesdays! Hubby actually put it ON his tacos, and he loved it! This salad is so good. I had to make a double batch 2 days in a row since it went so fast the first day. You would think it would be really spicy but it has just the right amount of heat. So good. Thanks for posting this recipe. This was one of the most incredible salads I've ever eaten. Thank you SOOO much for sharing the recipe. I LOVE THIS RECIPE!! I have made this about once a month for the last 6 months, maybe more! It is my new comfort food! I never stray from the recipe. I have made it with the Cotija and I have made it with the feta cheese. I prefer the feta. Thanks for sharing! So good, my wife and I are obsessed with this recipe and make it about twice a month cause we can never get enough of it. We even double the recipe so that we can eat off it for a couple of days. Thanks so much for sharing! Just like other Mexican food such as Mexican sandwiches and Mexican rolls, I think this Mexican Street corn salad will also be delicious. I will make this salad this weekend. Thanks for sharing the recipe. Hi there! I made this and it was DELICIOUS! I am trying to Pin it to be sure that I have the recipe to make again, but every time I try to do so Pinterest tells me that it cannot fetch the image....any idea why this is happening? Thank you for your help! We switched servers and are still trying to work out a few bugs. One of those being the Pin It button. Hopefully fixed soon. Thanks for your patience. Cojita =/= feta. You could use queso fresco if you don't like or can't find Cojita, but feta is not a good sub for Mexican smelly foot cheese. A sprinkle us all you need of Cojita to get the savory essence in there. This looks delicious! Do you use fresh jalapenos or pickled? You could use whatever you like. We used the canned jalapenos. Hello: Could you not use roasted frozen corn - i.e. frozen corn that has already been roasted - in order to skip the cooking process? Just curious. Wow! This is an absolutely awesome side dish. I was looking for something different to go with the pork street tacos we were having for dinner tonight. My family LOVED it. I used Queso Fresco instead of Cotija. Definitely a "keeper"! No one in my family has made corn for Thanksgiving in years so I will be making this x5! I hope this recipe multiplies well. It'll also be my first time making it! No Pressure! I know this was posted a while ago, but can this be made the night before and serves next day? You could make it the night before and serve the next day. That's how we eat the leftovers. You could also char the corn the night before and put in an airtight container in the fridge. Then the next day the prep would be minimal. Just mixing the other ingredients together and then mix in with the corn. We hope this helps! You can serve it immediately after preparing it and then it's warm. It's also delicious at room temperature. I just discovered this recipe. It is amazing. Made it just as written, definitely my new go to salad for the summer! The frozen grilled corn at Trader Joe's would be amazing in this recipe!